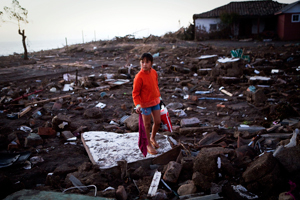 One year on from the earthquake and tsunami the poor are in a more precarious state. One year on from the earthquake and tsunami the poor are in a more precarious state. Indeed, an official government study reports that today Chile has 500 thousand more poor people as a result of the disaster. Road infrastructure, such as roads and bridges, has been rebuilt. But thousands of Chileans are still living in very poor-quality temporary accommodation, called mediaguas (shacks), in “villages” or camps that are not equipped with adequate services. The process of allocating grants for housing and the building of new homes has been slow, as people have to wait two or three years for more permanent solutions. Rehabilitation of some key services, such as healthcare, is also progressing slowly. For example, people in the Maule region are still being treated in temporary hospitals. The victims have had to deal with being forgotten by society and the authorities, as 2010 was marked by a large number of events with high media impact, such as the rescue of 33 miners in Copiapó. This poses us the challenge of keeping the spirit of solidarity alive and being aware of the needs of the thousands of Chileans who are still suffering from the consequences of the earthquake. Caritas provided humanitarian aid to meet urgent needs arising immediately after the disaster happened, which continued at full strength until June. During this period around 4,000 tonnes of supplies were mobilised (food, water and drinks, plastic sheeting, tents, blankets, bed linen, duvets, sanitary towels, nappies for children and adults, clothing, stoves, heaters, building materials, etc. ), which enabled us to assist approximately 800,000 people. This distribution of provisions over the wide area was facilitated by the immediate presence on the ground of local Pastoral Social-Caritas teams, parish priests and other pastoral and social workers, who were able to organise the available networks wherever possible by setting up a distribution platform consisting of 250 parishes and around 1,500 chapels in the disaster area, linked to municipalities and grassroots social organisations. In the context of isolation, interrupted road and communications networks and shortage of supplies in the country, the contribution made by Caritas was vital as we were able to deliver timely assistance to the most remote and needy communities, in many cases more quickly than the government. Together with the sense of urgency, humanitarian assistance also included an attempt to comfort people in their distress, by providing them with emotional, spiritual and psycho-social support. In the second phase, starting in June, efforts were focused on the rehabilitation and reconstruction process. We have promoted comprehensive projects for small communities including three components: housing and habitability; household economy; and community development. Via these projects, we are supporting more than 20 highly vulnerable coastal, rural and urban communities that have limited access to other means of assistance. The key strategy of these projects focuses on their overall reach and the active participation of communities via community needs analysis, implementation of housing and production initiatives, and social monitoring of the execution of a project. During this phase, via the projects implemented in 2010 – some of which will extend into the early months of 2011 – 235 homes have been gradually built and 594 repaired, 54 toilets have been fitted out, 432 household item kits have been delivered, more than 600 family and associational business enterprises have been assisted, and a psycho-social counselling process has been deployed in each community taking into account the specific needs of the various groups involved (boys and girls, senior citizens and women, amongst others). During the initial humanitarian aid response phase, we estimate that we assisted around 200,000 households, which is equivalent to 800,000 people. Via the rehabilitation projects, we have worked with 2,000 households – around 8,000 people – who have benefited from services in the areas of housing, household economy and community development. I would like to point out that this more focused second phase is significant not only in terms of the amount and coverage of assistance, but also because it doesn’t provide isolated and individual solutions. On the contrary, work is carried out with communities, which strengthens and empowers them as groups. Therefore, helping them build their capacities for self-help and self-management gives us hope regarding the sustainability of projects and their possibilities in terms of building a better future for themselves. Undoubtedly we have felt the solidarity of the Caritas family, which has shown its generosity in many ways. This has been vitally important and has sustained the work we have been doing. First of all, people’s nearness, the appeals, the messages via various media outlets and the visits that have enabled us to carry out our work feeling the support and encouragement of all members of the confederation. In times of trouble, we have experienced the importance of Caritas and its worldwide network in giving real hope to communities, so as to contribute to the respect of human rights and dignity, based on our faith in Jesus Christ, in a globalised world that still has a long way to go if it is to live in fellowship and justice. Therefore, together with our deep gratitude, we call for strengthening of this support for a fairer society that will enable the integral development of all its members.